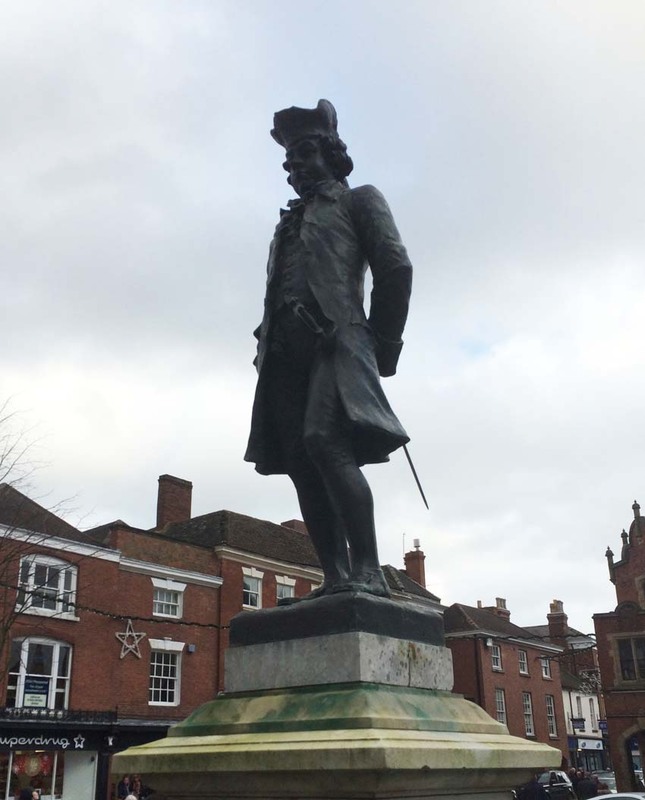 James Boswell (1740-1795), known for being Dr Samuel Johnsons Biographer, is here seen with a sword, notebook and stick standing proudly on his tall plinth in the market square next to where Dr Johnson is seated. Upon the plinth are medallions showing his friends – David Garrick, Burke; Goldsmith; Mrs Thrale; and Sir Joshua Reynolds. There are also scenes beneath Boswell depicting his friendship with Johnson showing them both in the Hebrides, having a drink together at the Three Crowns Inn, and at the Literary club in London. The Bronze statue was sculpted by Percy Hetherington Fitzgerald and is 1.9metres high upon a black marble base stone on top of a 1.8m portland stone plinth.